Why are they called Russell Terriers and not Jack Russell Terriers anymore? AKC decided that they could not use the name Jack Russell Terrier even though every other registry in the world uses the name. In the US, there is a non kennel club registry called the Jack Russell Terrier Club of America (JRTCA) that already uses the name..Therefore, in the US we are the Russell Terrier. We aren't the shorty puddin Jack. We are the correctly put together AKC Russell Terrier, the smaller 10 to 12 inch dog. Our dogs are neither short legged or long legged..We strive to breed healthy sound puppies with straight legs. Russell Terriers are compact and small, between 10 to 12 inches tall. We have been with the breed since the first club exclusively registered them. 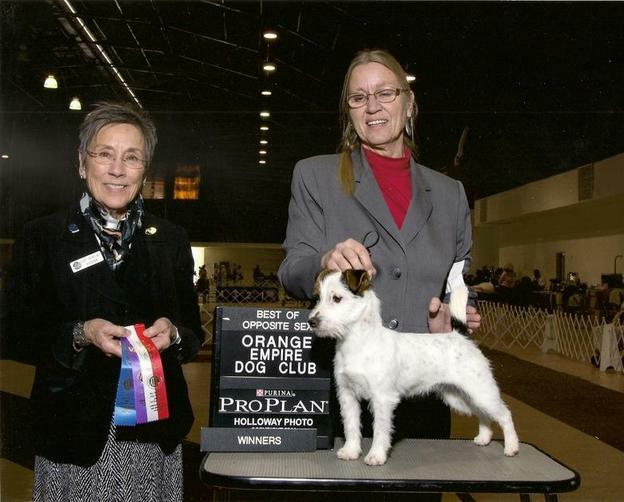 We are proud to have our generations of health tested dogs go forward in AKC as part of the foundation for the Russell Terrier breed in the US. We live in So California and have litters occasionally. Contact us to get our waiting list for the next litter. If you get a puppy from us, you get lifetime tech support. Call or email us with any questions: 951.928.1155. If we don't have any puppies available for sale, we will greatly refer you to another breeder, we personally know has good quality puppies.